First Ladies: Martha Barksdale 1921, M.A. 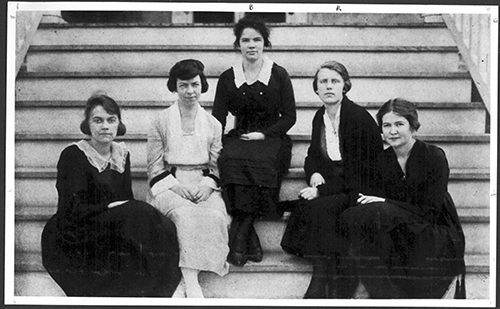 1929 (center) was among the first 24 women to be admitted to William & Mary in 1918. William & Mary was the first public university in Virginia to admit women. In 1918, the first women students walked through the doors of the Wren Building and made history. Since 1918, women unmistakably have become vital to the mission, success and survival of the university and its future. The university’s newest giving society, the Society of 1918, was named in honor of the women who made history that year. It aims to grow women’s engagement, leadership and philanthropy and celebrate and honor William & Mary women. The society supports the Alumnae Initiatives Endowment, which will enrich programming and enhance opportunities for women across the W&M community. Today there are more than 225 charter members. The society plans to continue growing the endowment after meeting the $1.918 million goal. The Society of 1918 is the outcome of the Women & Philanthropy Task Force, which was created in 2012 at the behest of the William & Mary Foundation. 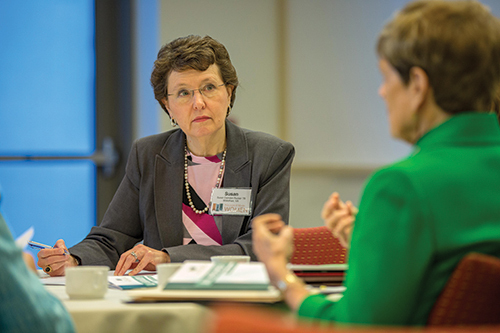 They studied existing research and best practices, conducted surveys and created strategies to fully engage women as leaders, donors and advocates of William & Mary. The task force became a leadership circle, which with the help of Director of Alumnae Initiatives Val Cushman created the Society of 1918. Women make up 58 percent of the Class of 2018 and 53 percent of William & Mary alumni. Research shows women approach giving differently than men. For example, women generally want to be asked, to feel engaged in the organizations they support through time and relationships and are more deliberate in their philanthropy. The Alumnae Initiatives Endowment is unique in that it is funded almost exclusively by and for women. It will enrich W&M women’s engagement opportunities throughout the country, provide exclusive programming for members of the Society of 1918 and help launch the new William & Mary Women’s Weekend for all W&M women, Sept. 21-23, 2018, added Cushman. Guest of honor: W&M President-Elect Katherine A. Rowe made a surprise appearance at the All Aboard event to welcome participants. Charter membership in the Society of 1918 is offered to all women who commit $10,000 or more to the Alumnae Initiatives Endowment by June 30, 2018. Payments of $2,000 annually may be made over a five-year period. 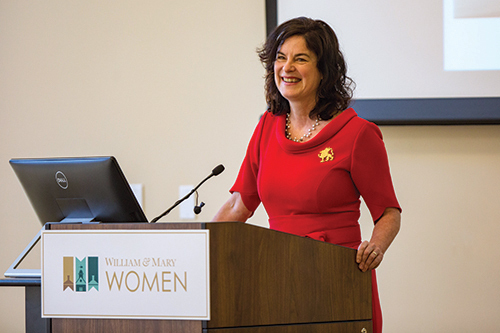 If you are interested in joining a vibrant group of women committed to shaping William & Mary’s future, please contact Val Cushman at vjcushman@wm.edu or (757) 221-1622. Visit wmalumni.com/societyof1918 for more information, and follow #wmwomen on social media to see more William & Mary Women initiatives.